Let's be honest. There are some wacky people in this world. There's no way to completely avoid negativity, but, that makes me even more grateful for the kind and loving people in my life. I'm very grateful for my family who continually show unconditional love. There is something very warm and reassuring knowing that they are there for me. I'm grateful for my friends who just 'get it'. We have similar expectations for our children and when we get together, everything just falls into place. When it comes to parenting, we're on the same page and that makes our time together so special. I value the teachers who I entrust to take care of and educate my kids. I appreciate the people I work with. They are a big reason that I love what I do. Those are some of the people that I am grateful for and, personally, I'm ready for the excessive amount of Thanks leading up to Thanksgiving. These relationships are truly priceless to me and saying "thank you" is important. I've seen some snarky comments about the over abundance of 'thanks' during November, and I feel sorry for anyone who feels like that. Life can get complicated. Let's celebrate what we're thankful for year round and if it gets a little excessive in November, so be it! This month, I'm working on a project with some other bloggers called 21 Days of Gratitude and I want you to join us. Each day a blogger will share something special. 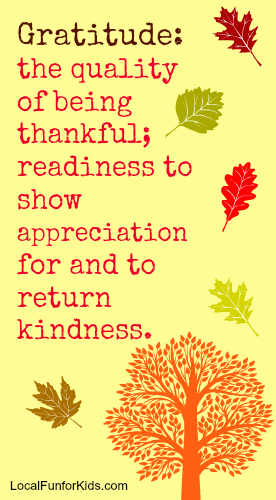 Maybe a quote, an activity, or their thoughts that will help us cultivate a heart of gratitude with our families. The schedule is here and all of the info for you to join in. Who ever knows if they're getting it right? Life, motherhood, marriage. It's all trial and error. I have great expectations for my kids. However, with that said, I also know that no one is perfect. Everybody makes mistakes and everybody is different. That's one reason why I just want my kids to be the best that they can be. They are not in competition with their friends to see who is the most academic or most athletic. If our friends have accomplished something great, I think it's important to celebrate with them. Let's be genuinely happy for them, but let's not get caught up in comparison. In the grand scheme of things success is so incredibly subjective anyway. A polished veneer doesn't mean things are perfect underneath. In an age of iPads and name brands, it can be easy to get caught up in these veneers, but that's not what's important. My goal is to teach my children to embrace what we have and be grateful for the many blessings in our life. I want to teach them confidence and the importance of aiming for their own personal best - not their friend's personal best. 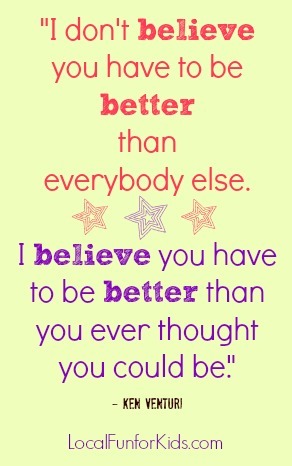 So, as we soon enter another season of sports and school, I want to be better than I ever thought I could be. I want to push myself to do more, learn more and love more. It's not easy when we face daily challenges, both big and small, but I'm up for the challenge. As a parent, that's my job. My kids are watching and learning. I love a good party. Bonfires, gigantic inflatable water-slides, dancing and swimming have all been part of some of our best parties with friends and family. If I was going to think big, I would love to have a huge family playdate with all of those things. But, when I'm planning playdates for my kids, sometimes less is so much more. Ever since spring began, we've been busy with school, sports, birthday parties, and lots of other events. Down time is something that I treasure. I love those moments when we don't have anything scheduled. It means we have more time for playing in the yard, eating dinner as a family, and letting my kids explore. Down time also means we have more time for spontaneous playdates. When my boys were younger I was little reluctant to invite friends over for playdates but now I know what works and it's fantastic. It's not about having amazing crafts or toys lined up. A great playdate is all about friendship. It's about imagination, quality time spent together and fun! For us, an epic playdate usually consists on having one friend over. That's it... just one. This gives my kids a chance to really bond with their friend. We've had lots and lots of playdates over the years and whenever we have one special friend it always works the best. Moms know, that when their kids are happy they're happy, right? It really doesn't take much to make a kid happy. So, a playdate at home, with a special friend may not seem "epic" to some people, but for us it is. This summer, I plan on continuing these play dates with my kids and their friends. I'm happy to spend so much time with my kids and give them an opportunity to nurture & develop their friendships. To me, that is priceless! If you could have an epic playdate, what would it be like? 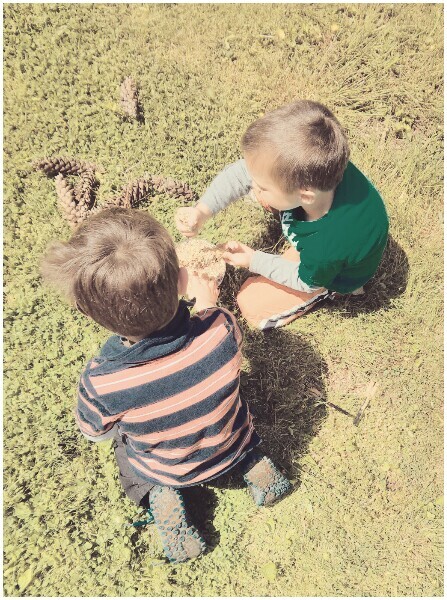 Did you see Jordan's amazing play-date in the Red Woods on the Oh Happy Day blog? If not, take a peek at her epic playdate video here.